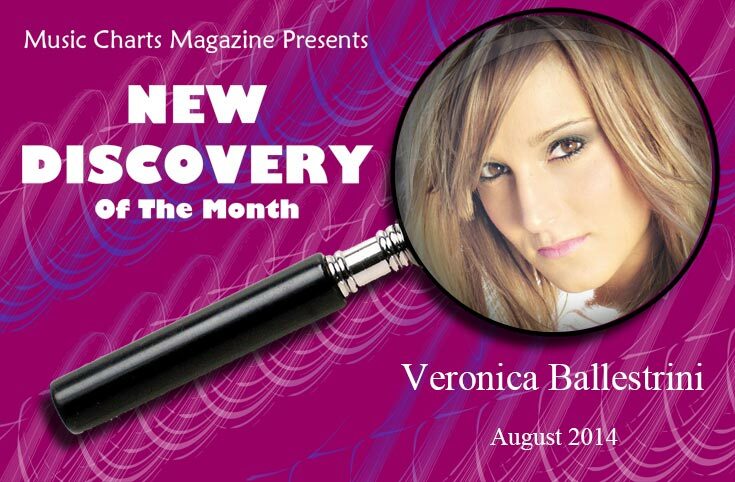 Music Charts Magazine® Presents – “NEW DISCOVERY” – “Veronica Ballestrini“- for the month of August 2014. Looking for some “New” music to add to your player and can’t find anything that blows you away? Check out this Music Charts Magazine® “NEW DISCOVERY” Interview with “Veronica Ballestrini” and be prepared to be excited knowing there is still 100% awesome music out there that you still have not heard. After you listen to this great radio interview pasted below of “Veronica Ballestrini” we are sure you will be glad you found this “New Discovery” and Veronica’s song “Cookies and Cream” to add to your music playlist. Veronica Ballestrini learned early on the value of our modern social media phenomenon. Over the last several years, in fact, her fan base has exploded exponentially, spreading to all corners of the globe. With one modest dream and an Internet connection, the enthusiastic yet mature-beyond-her-years singer from Waterford, Connecticut, has raised more than a few eyebrows with her self-made success story. as Jon Caramanica wrote in the New York Times, “… When someone like Ms. Ballestrini arrives essentially unannounced and begins to attract attention, it’s signiﬁcant.” The staggering numbers on her social network sites are proof that Veronica has that special ability to connect with people. She has amassed more than 4 million views of her videos on YouTube, and her online fans and followers number well into the hundreds of thousands. Veronica’s 2009 debut album, What I’m All About, capably demonstrated her unique take on the modern Pop-Country sound. She released three singles and videos from the record (“Amazing,” “Out There Somewhere,” “Don’t Say”), propelling her into the consciousness of Country music fans around the globe and earning more than a million views of her videos on CMT.com alone. “It makes my soul happy to know that music music has affected someone’s life for the better. Some of these songs I have written at my lowest times, feeling alone and broken. It’s good to know we’re not alone in these moments. To be able to reach people through music is something special. In 2011, Veronica began work on her Gotta Make A Change project, a process that set in motion her inspirational “Gotta Make A Change” tour. Throughout the summer, Veronica performed shows at various camps, festivals, Girl Scout events and women’s correctional facilities across the U.S. to help spread the project’s motivational message. Veronica released two singles in 2012 titled “Temporary Fix” and “Don’t Give Up On Me”. The music videos combined garnered over 1.5 million views on YouTube. Ballestrini spent most of 2013 on tour with Secondhand Serenade, Alex Goot, and ‘The Voice’ singer Juliette Simms. and traveled around the country with the ‘Fiesta Movement’ representing Ford. Veronica shot a car commercial for the Fiesta, where her duet with Secondhand Serenade titled “La La Love” is featured. The last three years Veronica has been writing songs for her new project. As she says in her own words “I wanted this new album to perfectly reflect what I’ve been up to… It has been a crazy ride, there have been many ups and downs. My happiness and heartbreak wrote this album.” Her sophomore album “Flip Side” is set to release June 17th, 2014, produced by Brandon Metcalf at Destiny Nashville. The first single off of the album is “Cookies and Cream”. Veronica’s most focused and polished effort to date. “Cookies and Cream” reflects Veronica’s growth as a more mature singer and a more seasoned songwriter. It’s a process that she acknowledges is a natural evolution in her artistry. Radio interested in how to obtain this music please contact us on our contact page and we will be glad to get it to your radio station for radio play. Many thanks to those of you who have already played it. Copyright © 2012 – 2014 Music Charts Magazine, INC – All Rights Reserved. Contents of this site including text and media may not be reproduced without prior written consent. Audio and video elements of this site are property of their respective owners and are used with permission.